Roulette is one of the most popular casino games, and like every casino game, the winning odds at roulette are invariably stacked against the punters. However, with some logical analysis and a few basic tips, it is possible to have a better chance of beating the house and winning in roulette. The process of roulette involves rolling of a ball around the wheel’s rim spinning in the reverse direction. The ball eventually rolls onto the spinning wheel where it gets hit by one of the several deflectors. The deflector sends it bouncing randomly until it lands in a particular slot. If one is able to identify where the ball begins bouncing, it is possible to narrow down which of the 36 numbered slots will ultimately receive the ball. Maintain the table minimum and play just the outside bets. For instance, you can bet on either black or red for each spin. This type of outside betting tactic pays 1 to 1 and manages to cover 18 of the possible 38 combinations. Place two different bets of equal amount on two outside bets. Out of these two bets, one should be an even money play and the other on a column or dozen that will pay 2 to 1. For instance, you can place one bet on black and the other on Column Three, which has eight red numbers. This gives you a total of 26 numbers to hit, out of which you cover four twice. You may also place a bet on red and pair with a bet on Column Two with eight black numbers. This again lets you cover 26 numbers, out of which four have two ways to win. Pairing a bet on either black or red with Column One lets you cover 26 numbers, out of which six numbers have two ways of winning. Spreading bets in this manner improves your winning odds. 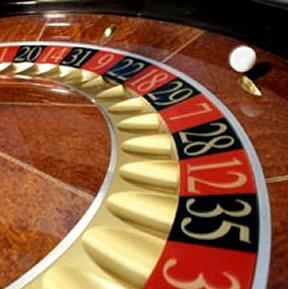 Your winning odds can improve significantly in roulette, if you happen to play a single-zero European wheel. The house edge in this case is just half that of the American wheel roulette, which makes it only 2.63 percent. Top casinos in Las Vegas such as Mirage, Bellagio, Caesars Palace, and other destinations usually provide a European wheel. If you cannot spot it on the floor, it may be set up in the high limit area, so you may simply ask for it. The table minimum may be higher, say $30. However, since the house edge is half, the European wheel improves the chances of winning, particularly for bigger bettors.